Prepping is no longer just a thing us “crazy Americans” do. The popularity of stocking up and being prepared for future events is spreading across the globe as people everywhere are losing faith that the way things are now are the way things will always be. Now that folks in the United Kingdom are facing Brexit, or the exit of the UK from the European Union, a lot of people there are currently debating whether they should be stocking up. If there’s one thing that’s absolutely true, it’s the fact that human beings, in general, don’t want to expectthat something bad may be about to happen. This is the reason that a lot of folks are hesitant to stock up ahead of time before that bad event occurs. This is the reason you see bare shelves right before a looming disaster. This is the reason you see people fighting over that last case of water at the store. Why are people prepping for Brexit? Here’s what’s threatening the way of life in the UK right now. Nevine Mann is not readying herself for the threat of nuclear war, flooding or civil disorder in this part of Cornwall, in scenic southwest England. No, the specter that keeps her on edge is Brexit. Ms. Mann, 36, has joined the country’s band of “Brexit preppers,” people who fear chaos in March, when Britain will leave the European Union, and who are stockpiling supplies. For more than 18 months, Britain has been trying to negotiate a deal with the European Union, without which the country could face gridlock at ports, trucks stuck on highways with their loads of food spoiling, empty grocery and pharmacy shelves, energy scarcity and factories shutting down. Britain imports around one-third of its food from the European Union, and businesses rely on complex supply chains that could break down if checks are imposed on the thousands of trucks that cross the English Channel each day. This being Britain, people are not retreating to underground bunkers, as America’s “Doomsday preppers” do, and Britons are more likely to hoard toilet paper than weaponry. But with time running out and negotiations at a delicate point, some Britons are preparing for a crisis that could upend their way of life. “This has the potential of being a combination of the two,” she said. There’s a lot of uncertainty about what will actually happen if an agreement can’t be reached. I belong to a group that is trying to help people get stocked up for Brexit in the UK. The issue is that many of the things that are in the British food supply are imported from Europe. The chemicals to treat their municipal water supply? Imported from Europe. When they leave the European Union shortly, it’s possible – even likely – that there will be shortages and issues. It’s a friendly, helpful group full of kind people who are dealing with something practically unheard of in a nation that doesn’t really have much in the way of natural disasters. Now, any American prepper would guffaw at the very idea of this question…but non-preppers would find it completely reasonable. So that’s why I wanted to write this article about why you should not wait for a crisis to get stocked up. While it’s written with folk facing the Brexit in mind, it’s also applicable to anyone, anywhere. I’m a firm believer in being stocked up even when there’s nothing but clear skies on the horizon. You’ll get things at a better price when you shop ahead of a crisis. When it looks like a crisis of some sort is headed your way, you can often expect prices to escalate before and after it occurs. In the case of Brexit, it’s extremely likely that people will see an uptick in food prices, if not before then definitely after. Currently, things that are imported from Europe cross easily into the country but afterward, there will be delays and extra costs. This will cost money and that cost will definitely be passed on to the customer. And there’s also the threat of price gouging. We’ve seen here in America people gouging prices after a disaster. In Houston, after Hurricane Harvey, there were reports of people asking $20 for a gallon of gasoline and $99 for a case of water. Shortly before Hurricane Maria struck Puerto Rico, flights off the island were as much as $3200. And yes, it’s against the law. But a lot of people are willing to risk it to make some quick cash. When the supply greatly outstrips the demand this is what happens. It isn’t ethical but that doesn’t make a difference. It’s reality. There are anti-competition laws in the UK that forbid outright price gouging but that doesn’t mean it won’t happen. Please don’t put your faith in people obeying the law when there’s money to be made. Lots of people will charge the high prices and hope not to get caught. And, if the costs of getting the goods increase dramatically, it’s not illegal to pass that on to the customers. If the bad thing occurs, you won’t be competing for scarce resources. If there’s one thing I know, it’s that ahead of an emergency, right before it happens, everyone dashes to the store and buys up supplies in a frenzy. And they get downright angry when supplies are limited. Everyone has seen bare shelves before a winter storm or hurricane. Now imagine what the shelves will look like if suddenly it’s announced that certain important supplies will not be available for six months. Try to picture the panic as everyone in your city rushes to the store nearest to them to get as much as they can of those supplies. It’s absolutely a fact that people who are panicking behave badly. Here’s just one example of people fighting over the last case of water. You may look at this and think, “Oh, I don’t live in an area where people act like that.” Trust me when I tell you we all live in an area like that when food is in short supply. All of us. You know how people behave on Black Friday to get things they don’t really need? How do you think those same people will behave when the supplies in the store are the difference between them eating or starving? Because clearly, they are out there. We have them on video. And it isn’t just an American phenomenon. The video below is from the UK in 2018. And that’s for things like televisions. Not because people are worried about running out of food. When the announcement comes that food or water is about to be in short supply, you want to be safely at home with your family, not out in the stores, frantically competing for limited resources. Your safety will not be compromised by you being out there after it happens trying to find supplies. The incidents mentioned above are all about people merely shopping or trying to stock up before an event. If it’s that bad before anything has happened, can you imagine what it will be like after it happens? Actually, you don’t have to imagine. All you have to do is look back at the New York City area after Hurricane Sandy struck in 2012. Not only was there flooding and a lengthy power outage, but there were also fuel shortages and a lot of folks didn’t have food or water on hand. At gas stations, there were lines that took anywhere from 45 minutes to three hours and if you were lucky, there was still fuel when you reached the pumps. Fights and unruliness broke out as some people tried to cut the line. Alan Marwan worked at a Sunoco station in Prospect Heights. Even after FEMA arrived to provide relief with free gasoline, the violence continued. The frenzy for gas, fueled by long lines and shuttered stations, reached a fever pitch Saturday even as a massive tanker full of relief sailed into the harbor. …The already-edgy crowd erupted when one man tried to cut the FEMA line with a 2-gallon gas can — and it took six police officers to restrain him from getting his precious fuel. The gas hog was eventually cuffed and taken away, as much for his own safety as anything. It wasn’t just about fuel, though. The fuel lines were nothing compared to the frenzy for food and water. 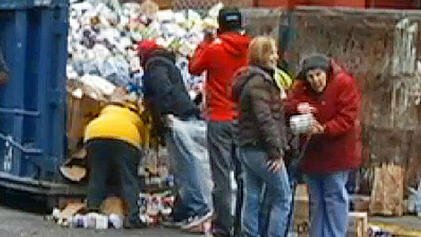 After only 72 hours, people were desperately rummaging through garbage for food. SHTFplan reported on some of the posts on Twitter about the situation. And here was the line for food that was being distributed by FEMA. Please don’t think this is something that can only happen in the United States. Desperate people are desperate people, no matter where they are on this planet. The good news is that you can avoid all this by stocking up before what threatens to be a potentially disruptive event. You’ll be prepared for other emergencies that come along. Whatever event you’re considering stocking up to prepare for, please know that it isn’t the only event that could occur. No matter where you live, there are things like storms, unexpected power outages, contamination of the water supply, and interruptions of transportation that could mean a temporary disruption of the supply line. But if you have food and other supplies on hand, these events will barely be a blip on your radar. You’ll be far more likely to be comfortable, well-fed, and content regardless of the situation. Supplies like non-perishable food, flashlights, candles, and water will help you through a wide variety of different disruptions to your everyday life. And this isn’t even to mention the most common type of emergency, a personal financial problem. If you suffer a loss of income, a huge unexpected expense, or a cost-of-living increase, the supplies you are putting aside right now will help you through that. You’ll be just fine if you have to miss a few trips to the grocery store because you’ll have food already put aside to see you through it. Your supplies won’t be wasted if you get supplies your family will enjoy. A prepper adage is to eat what you store and store what you eat. If you follow that rule, you’re not wasting any money by stocking up. Will you ever not use the toilet paper that is sitting in your closet? Will you ever not eat the food that you’ve put aside? Will you ever stop drinking water? Stashing away tea, coffee, canned goods, crackers, beans, water, and rice is always a good idea. You’re always going to eat, you’re always going to need personal hygiene supplies, and you’re always going to drink water. You’re not wasting your money by purchasing these things at the best prices you can find and stashing them away for a rainy day. While I strongly recommend stacking food, water, and health and hygiene supplies to the rafters, I’m not as keen on advising you to purchase expensive high-tech solutions. Investing thousands in generators and that type of thing may not be as good of an idea or as universally useful. Go low-tech with your preps and plan to live a different lifestyle if things go downhill for a period of time. You have to remember that a generator only runs while you have the fuel to run it, and there’s a limit to how much fuel you’re going to be able to stash away. Here are some ideas for less expensive, low-tech prepping. Spend your money on the things you know you’ll use and you will be set for anything from Brexit to supply disruptions to winter storms. How would you advise people facing Brexit to prepare? This site is loaded with experienced preppers who’ve been at this for a long time. 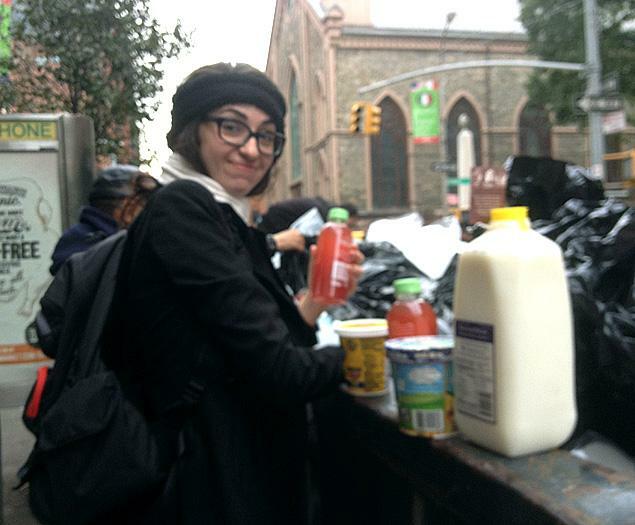 What advice do you have for people who live in a place where prepping isn’t the norm? What should they stock up on? What are some things you think they should know? Please share your advice in the comments below. Previous How Does the “Deep State” Push Their Agenda Forward Without America’s Politicians Doing it for Them? They Cannot!